This post is entirely out of order. I have half a dozen other things I've been meaning to tell you about queued up, but this was just too freakin' cute. I know, there's an overabundance of pink in this, which is entirely out of character, but I had an entire batch of macarons with perfect feet on every single shell and not a single casualty! That's unheard of odds for me. Not to mention these have ears and whiskers and bows. The cuteness is overwhelming. 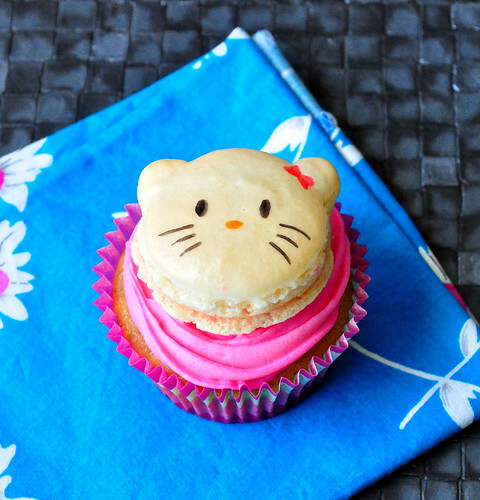 I saw the Hello Kitty macarons at I Heart Baking a long time ago, and I remember mentally filing the idea away for some distant future, and my mental secretary made sure to dredge up the idea when an order came in for Hello Kitty cupcakes. They're not as perfect as hers, but pretty good for a first try. I used the simplest recipe from the macaron queen: Mrs. Tartlette, filled them with the strawberry cream cheese frosting and plopped them on top of the best banana cupcake I've ever made. I sure hope the birthday girl likes them. I used Tartlette's recipe without any adjustments, so please go over to her site for directions on how to make your own macarons. Just remember to pipe the batter into a slight oval and to give the oval ears, then once they're cool and dry draw on the face with food color markers. The recipe for the banana cupcakes I adapted from this one from Cake Journal. - Preheat the oven to 325F and prepare two cupcake pans with wrappers. - In a large bowl cream the butter and sugar till light and fluffy. - Add eggs one at a time. - Mix the mashed bananas with the vegetable oil and then mix into the butter mixture. - Warm up the milk in the microwave. Make sure you watch it though or it will bubble up and run out of the cup. Stir in the baking soda, which will foam up, and then mix the foam into the banana mixture. - Mix in sifted flour & baking powder just until combined. - Fill cupcake cups halfway and bake for 18-20 minutes until very lightly golden on top and a toothpick comes out clean. Don't overfill the cupcake cups because the batter will rise and overflow, leaving you with a delicious mess that you'll just end up eating on your own. Not good. - Whip the cream cheese and the butter together until combined and fluffy. - Add the jam and the powdered sugar and whip until incorporated. 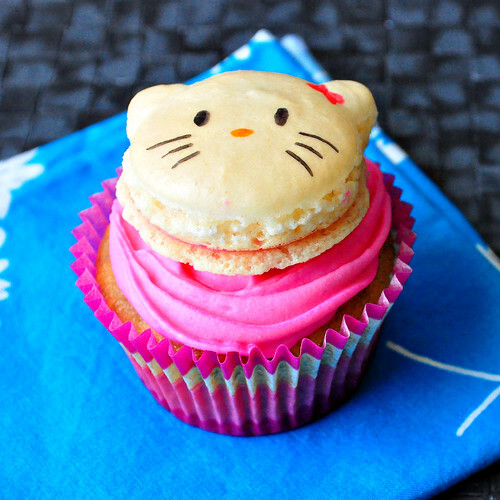 - I used my own jam, which made the frosting a dull pink shade, so I added some pink food coloring to get it to Hello Kitty standards, but you can skip this part if the shade doesn't matter to you. Yours are beautiful and a clever idea for a garnish for a cupcake!!! very cute, nice job! :) thanks for linking to me! First time here and I loved my stay here! Really nice recipe. Absolutely mouth-watering!! Have you got anything left for me?